Kohler has been making generators since 1920 and utilizes that experience to remain a leader in the production of residential generators. 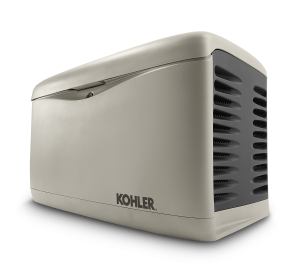 Kohler generators offer 23 different standby generators, ranging in size from 6kW all the way up to 150kW, all fueled by either diesel, natural gas or LPG. There is a Kohler product ready to protect your family or business and provide peace of mind tailored to your power needs. Powerboost technology gives Kohler generators an edge over the competition. This provides excellent starting power for the 8kW, 10kW, 12kW, 14kW and 20kW generators. Kohler is known for their reliability and performance. Every one of their units have a 5 year or 2,000 hour limited warranty. From their corrosion-proof enclosure on the outside to their commercial-grade engines on the inside, Kohler generators are designed for extreme workloads over many years. They will outlast every outage. The OnCue® Plus Generator Management System is the latest in remote monitoring. It sends status alerts and lets you check generator history no matter where you are in the world. PowerPro factory trained technicians stand ready to install and maintain all of the Kohler generator line of products. From start up to preventative maintenance programs, PowerPro Service Company and Kohler have the proper tools for any job, with nearly a century of experience generating the right answers to any energy need.